The common symptoms of shoulder instability include pain with certain movements of the shoulder; popping or grinding sound may be heard or felt, swelling and bruising of the shoulder may be seen immediately following subluxation or dislocation. 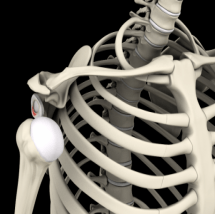 Visible deformity and loss of function of the shoulder occurs after subluxation. Sensation changes such as numbness or even partial paralysis can also occur below the dislocation as a result of pressure on nerves and blood vessels. 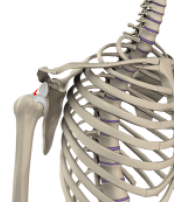 Closed Reduction: Following a dislocation, your orthopaedist can often manipulate the shoulder joint, usually under anesthesia, realigning it into proper position. Surgery may be necessary to restore normal function depending on your condition. Medications: Over the counter pain medications and NSAIDs can help reduce the pain and swelling. Steroid injections may also be administered to decrease swelling. Physical Therapy: Exercise programs focusing on strengthening the secondary stabilizers of the shoulder, including the rotator cuff muscles and shoulder blade muscles, often help restore the functional stability of the shoulder. When these nonoperative treatment options fail to relieve shoulder instability, your surgeon may recommend shoulder stabilization surgery. Shoulder stabilization surgery is done to improve stability and function to the shoulder joint and prevent recurrent dislocations. It often can be performed arthroscopically, depending on your particular condition, with much smaller incisions. Arthroscopy is a surgical procedure in which an arthroscope, a small flexible tube with a light and video camera at the end, is inserted into a joint to evaluate and treat the condition. The benefits of arthroscopy compared to the alternative open shoulder surgery are smaller incisions, minimal soft tissue trauma, and less pain.